Social media is taking over the world. Don’t panic though, that’s not a bad thing. For example, how many of you came across this article while cruising through your LinkedIn or Facebook timelines? For the most part, social media is something that we use to stay connected with family members across the globe, plan events with groups of friends who are all on different schedules, and keep up on all the latest current events. Plus, let’s be honest, social media is pretty helpful when it comes to staying up-to-date on the hottest memes the internet has to offer. 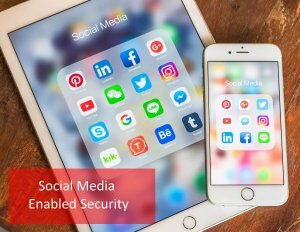 One thing you probably don’t consider when thinking about the beneficial aspects of social media, however, are its constantly evolving security applications. Social networks provide a highly connected communications infrastructure which is not only omnipresent, but highly mobile as well. Through applications like Emergency Response and Identity Management, the existence of social media makes your life a safer, more convenient one every day. As detailed in documents from both the U.S. Dept. of Homeland Security & U.N. Office for the coordination of Humanitarian Affairs, the most prominent use of social media in security is through public safety and emergency response. The first example that jumps to mind is Facebook’s “Safety Check.” This system allows users to quickly confirm their wellbeing during times of emergency. Safety Check detects the emergence of a crisis and establishes dedicated resource pages and hashtags relevant to the event at hand. It’s an undesirable situation by any stretch, but if, for example, a loved one were vacationing in a part of the world where a hurricane was taking place, this feature is able to provide instant peace of mind to everyone on their Facebook friends list. This saves them from spending precious time calling or sending messages to multiple people in their contacts, and will help to put the minds of those close to them at ease. Identity Management is another way that social media is making our day-to-day lives more secure. Think about it, when was the last time you went to log on to a website and were confronted with the option of signing in via email & password, or linking your account to your Facebook profile? It’s now incredibly easy and hassle free to jump onto your online bank account, pay your cell phone bill, or access just about any of your accounts online as long as you have the credentials for a social network, such as: Facebook or Twitter. Identity management is not only a method to access online accounts; it is also becoming a way to gain access to physical spaces. As social media grows, so grow our identity tokens – authenticators used to prove our identity – along with it. Our social media identities are becoming as unique as our fingerprint, and will surely be the logical replacement for the many physical tokens we carry around on our person. Social media is one of the most powerful tools at our disposal, and never seems out of arms reach. In fact, most of the time we use it without even thinking about it. While mostly utilized for leisurely activities, it’s important to remember that networks like Facebook can act as a way to inform loved ones of your safety during times of crisis, and can be used as an elegant way to identify us. It’s easy to take these applications for granted seeing as we use them so frequently, but in the grand scheme of things, they’ve only been around for a short time, and will only continue to grow and make our lives more secure.